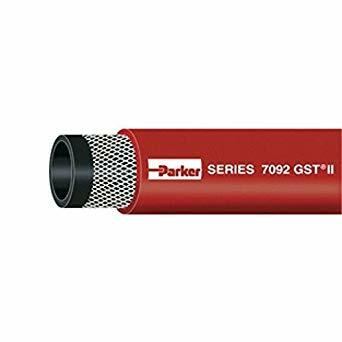 Parker's GST II General Purpose Industrial Air & Water Hose provides excellent service across multiple applications. 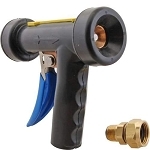 The hose tube is compatible with light oil mists for tool lubrication. 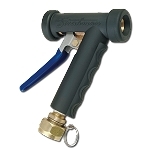 The hose cover is available in multiple colors for easy identification, and also resists abrasion and weathering. GST II hose is available in long continuous lengths for efficient inventory management and maximum utility at cramped or hard to reach job sites. The hose is qualified with permanent crimp couplings for a safe and secure connection and is a versatile hose for many common industrial applications. • Tube: Black EPDM for versatile and economical service to 212°F. • Cover: Black, blue, green, red or yellow EPDM for abrasion and weathering resistance. • Couplings: Qualified with steel crimp couplings for a durable, safe and secure connection.